Rift is Oculus VR's flagship virtual reality (VR) product line that uses a head-mounted display (HMD) and infrared sensors to create a PC-based VR experience. The system originally shipped with an Xbox One controller, but specialized VR controllers were introduced later on. Oculus Rift was developed by Oculus VR, which is owned by Facebook. Although Rift isn't based on SteamVR, it is capable of playing Steam games due to compatibility with OpenVR. How Does Oculus Rift Work? There are two main components included with every Rift: a head-mounted display and an infrared constellation sensor. The head-mounted display has two separate screens inside with Fresnel lenses mounted in front of them. When a player straps on the headset, and looks through the lenses, the result is a 3D effect that creates the illusion of a virtual space. The constellation sensor is a small visual sensor that is capable of detecting infrared light. It comes connected to a stand that can sit on a desk, but the mounting screw is compatible with wall mounts and tripods and designed for cameras. In any case, the constellation sensor must be placed in a location where there is an unbroken line of sight between it and the Rift. The Rift head unit itself is covered with a constellation of LEDs that are invisible to the naked eye. These LEDs emit infrared light that the constellation sensor is capable of detecting, which allows it to tell when the headset moves or rotates. This information is then used to move or rotate the player's view inside the virtual space. In addition to these components, the Rift also requires a gaming PC with Windows 8.1 or 10 and a powerful video card. The Rift connects to the PC via HDMI and USB cables. Since the PC is what actually runs games, Rift simply doesn't work without a compatible computer that meets some minimum specifications. In cases where a computer is technically capable of running VR games, but it doesn't meet Oculus VR's minimum specifications, the user will see a warning message in VR whenever they put on the head unit. What are Oculus Touch Controllers? When a second sensor is added to the system, it becomes possible to track the position and movement of Oculus Touch controllers that are also studded with constellations of invisible LEDs. Each controller is split into two separate components, so that a player holds one in each hand. These are then tracked separately, which allows Rift to simulate the movement of a player's hands in a virtual space. Through the use of sensors and buttons on the Touch controllers, Rift can tell when a player is making a fist, pointing, and making other rudimentary gestures. The controllers also include dual analog sticks, which is necessary for games that were designed with an Xbox One controller in mind. In addition to tracking Touch controllers, the addition of a second, or third, sensor also enables a VR feature called "roomscale." Basic virtual reality allows a player to see a three dimensional world and change the direction they're looking in by turning their head. That much is possible with just an Oculus Rift headset and a single sensor. But to actually move around in a virtual world by physically moving around in the real world, Rift requires additional information. By hooking up two sensors at the same time, Rift is able to able to tell when a player moves their head forward and back, or left to right, in addition to turning it from side to side. The addition of a second sensor also reduces the chance of too many of the LEDs getting blocked from view, and the addition of a third sensor adds even more redundancy. Placing the sensors in the corners of a room, or a smaller play space, enables the roomscale feature. This feature essentially allows a player to move around in a virtual space by physically moving around within view of the sensors. Comfortable controls: Ergonomic Touch controllers are lightweight, feel good in the hand, and include dual analog sticks. Ergonomic design: Adjustable head strap and lightweight design make for a comfortable VR experience. Three dimensional soundscape: Built-in headphones capable of reproducing 3D sound, or remove them and use your own headset. Exclusive games: Oculus Home platform includes some games you can't get on other platforms without complicated hacks. Roomscale available: Units that ship with Touch controllers and two sensors are capable of roomscale out of the box, or add a third sensor for even more realistic movement inside VR. Manufacturing status: Still being made. Available since March 2016. 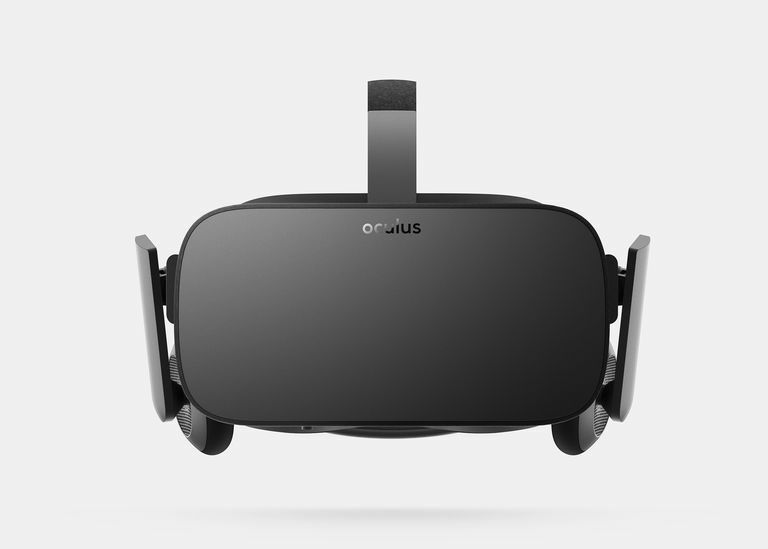 Oculus Rift is Oculus VR's first official consumer product. Although the Rift DK1 and DK2 were both publicly available for purchase, they were both aimed more at developers and hobbyists. One of the biggest differences between the DK2 and the final version of the consumer Rift is the type of display. Both the DK1 and DK2 used a single display that was split to show different images to each eye. The Oculus Rift bumped the resolution up to 2160x1200 in the form of two separate 1080x1200 displays. This separation of the displays allows them to be moved closer together, or further apart, to match the interpupillary distance (IPD) of an individual user without reducing the overall field of view. The headset also includes built-in headphones that are capable of reproducing 3D sound. If a user prefers to use their own headphones, the built-in units can be removed with an included tool. Unlike the HTC Vive, which saw multiple small revisions over its lifespan, the Oculus Rift hardware remained unchanged. That means you can purchase an older Oculus Rift, or a brand new one, and the hardware will be the same. The only real difference between launch units and later Oculus Rift packages is the type of controller. Units Packaged prior to August 2017 came with an Xbox One controller and a single sensor, because Oculus VR had not yet developed its own virtual reality controller when the headset launched. Later units shipped with two sensors and the Oculus Touch controller in place of an Xbox 360 controller. The Touch controller was also made available for purchase separately. Manufacturing status: Released July 2014. No longer being made. The Rift DK2, which stands for Development Kit 2, was the second version of the Oculus Rift hardware that was sold directly to both developers and VR enthusiasts. The nominal field of view was slightly narrower than the DK1, but virtually every other aspect of the hardware saw improvements. The biggest change with the DK2 was the introduction of outside in tracking, which is a system that used an external camera to track the position of infrared LEDs on the DK2 headset. This system was capable of full positional tracking of the headset, which allowed users to move their heads forward and back, and left to right, in addition to simply looking around. The DK2 also implemented an OLED screen, which is the same type of display used by commercial VR devices like the HTC Vive and PlayStation VR. The pixel density was also improved to 1920x1080, which is the same resolution as PlayStation VR. Manufacturing status: Released March 2013. No longer being made. The Rift DK1, which stands for Development Kit 1, was the first version of the Oculus Rift hardware that was sold to the public. It was initially available as a backer reward from a Kickstarter campaign, but it was also available for both developers and VR enthusiasts to purchase directly from Oculus VR. The resolution of the DK1 is significantly lower than later versions of the hardware, which contributes to a visual effect where it seems as if the user is looking at the game through a screen door. The hardware also lacked full positional tracking, which means a user can look from side to side, or up and down, but can't physically move around inside the virtual game space.